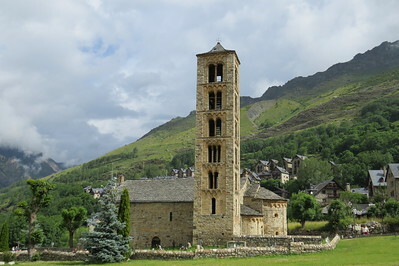 The Catalan Romanesque Churches of the Vall de Boí are nine Early Romanesque churches, making it the site of the densest concentration of Romanesque architecture in Europe. The picturesque setting of these churches, their lean towers contrasting against the backdrop of the Pyrenees, is the strongest point of this WHS. Most of the villages they belong to have a nice medieval feel to them too. Unfortunately, the original murals have all been taken away (“preserved”) to museums in bigger Catalan cities such as Barcelona. I visited 5 churches, and after that felt I had seen enough of them. In my opinion, the two in Taüll are the most impressive. The large Sant Climent church is visually striking, it makes you want to take more and more pictures. It also is a very popular destination, my arrival coincided with a large tour bus. We all strolled on uphill through the touristy streets of Taüll, to the Santa Maria church. It lies in an enclosed area at the town’s plaza, and although it doesn’t look much from the outside the restored murals here are very fine. I had stayed overnight in Erill la Vall. Here I visited the Information Center of the Boí valley. A video is shown that gives you a feel for how and why these peculiar churches came into existence, and why here. I guess these Catalan pilgrims were just jealous of the art and architecture they saw in Rome and the north of Italy, and wanted to take something of it with them home. This resulted in the “import” of Lombard builders and craftsmen. 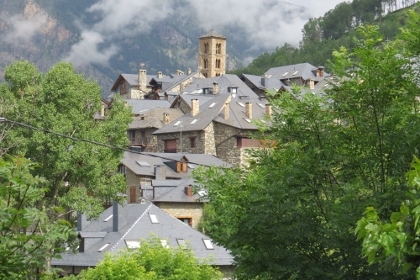 The Vall de Boi is a narrow valley in the Pyrenees and is best known for its nine Romanesque churches. The high density of pure Romanesque architecture far away from big cities and major trading routes, their location in a rural setting and the picturesque mountain scenery are the characteristics of this WHS. The rulers of the valley, the Lords of Erill, became rich by trading with silver and they have spent part of their wealth for the construction of churches and their decoration with wonderful murals. However, the murals were removed at the beginning of the 20th century to prevent theft and destruction, they are now kept in museums, the most important murals are in the National Museum of Art of Catalonia in Barcelona (MNAC). The churches in Taüll and Boi show some faithful replicas. 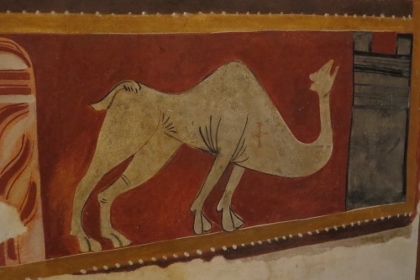 The murals depict saints and apostles, scenes from the Bible, and also mythical creatures and animals: a camel or an elephant with tusks on the head. We started our visit at the Centre del Romànic in Erill la Vall. The interpretation centre provides information about the history of the churches and the murals. You can also buy a combined ticket for the three churches in Boi, Taüll and Eril la Vall. A fourth church, Santa Maria in Taüll, can be visited free of charge, the others are not regularly open to individual visitors. The largest church in the valley is Sant Climent de Taüll, it also has the most striking architecture with three naves and apses, nice decorative elements at the outside, and a leaning bell tower. Every 30 minutes, a projection by video mapping recreates the frescoes in the central apse - an intriguing impression how the original interior might have looked like. Santa Maria de Taüll is located in the centre of the village, only a few hundred metres from Sant Clement. Why two churches were built at the same time in such a small village is not known (they were consecrated on consecutive days in 1123). Each of the nine churches has its unique charm and is well worth a visit: Sant Joan de Boí with beautiful colourful wall paintings, Santa Eulàlia d’Erill la Vall shows a copy of the wooden sculpture "Descent from the Cross", or the location of the small hermitage Sant Quirc de Durro on a rock spur high in the mountains. Most of the villages are located along the main roads L-500 and L-501 and are easy accessible by car. But, as Clyde describes in his review, the route to some churches requires driving on narrow, winding streets, in particular to Durro and Coll. Thus, we were very happy with our small rental car. During our visit to Barcelona a few days before, we visited the MNAC, the huge collection of Romanesque art is outstanding. The murals from Taüll and Boi and many other churches in the Pyrenees are shown. And the collection comprises also wonderful wooden sculptures and altar frontals. A great addition to our visit of the Vall de Boi. I visited this WHS in May 2014. 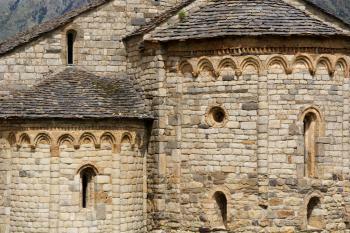 It consists of series of 9 Catalan Romanesque Churches scattered in the Vall de Boi. The location of these churches in the high Pyrenees makes them very picturesque although quite difficult to visit without a car. However, if you decide to drive, bear in mind that you will be driving in countless hairpins, narrow roads and mountain passes for most of the time. Online I found a very good brochure of this WHS from the Centre Romanic in Erill la Vall (http://www.centreromanic.com/churches-opening-times-2014/fitxers/llibret_romanic_07_angles.pdf) with pointers on each church. Since I was driving from the Ordesa Valley, I decided to start with the Church in Coll. This is quite different from the rest of the churches and its main highlight is its carved entrance. To get to it I had to drive for 2.5km in a VERY narrow road (although paved) and since I arrived quite early in the morning I disturbed at least 5 deer along the way so I had to be extra careful and drive slowly to be on the safe side. Unfortunately this church together with the ones in Cardet, Barruera and Durro are usually closed unless there is a group of at least 20 people that make a request in advance to visit them. They don't have frescoes inside anymore although they contain colourful altarpieces. The church in Cardet and the Ermitage de Sant Quirc in Durro are quite similar and both are located at an altitude of 1600-2000m. I very much preferred the Ermitage though as it offers a magnificent panoramic view of the Vall de Boi and the surrounding mountains. The only sound you get to hear up there are the cow bells and the pleasant mountain breeze. The church in Barruera is the largest one in the Vall de Boi and its exterior is also the most beautiful in my opinion. In the village of Durro below the Ermitage, there is another church (Nativity) and I was very lucky to visit when it was open since there was a mass being celebrated inside. I quickly peeked inside and I immediately fell in love with the tiny interior and the very personal mass celebrated with only 2 elderly ladies attending. The colourful alterpiece and church furniture was a big bonus to see and my personal favourite was the colourful baptismal font close to the entrance. Next, I proceeded to Erill la Vall where I bought a combined ticket to be able to visit 3 churches + the centre romanic for 8 euros. 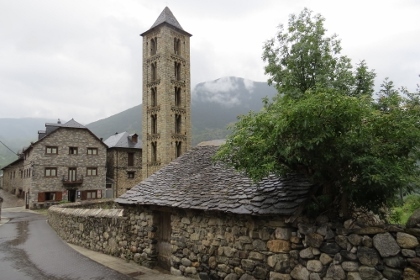 The centre romanic is in Erill la Vall just behind the church and it offers an interesting overview of the Vall de Boi churches through various videos and information boards. Since it costs only 1e extra to visit if you buy the combined ticket, I think it is worthwhile visiting if you have the time. The churches in Erill la Vall and Taull all have similar bell towers, although I preferred the one of St Climent in Taull mostly because of its splendid location. Inside the church in Erill la Vall there are replicas of wooden figures such as Christ on the Cross, Nicodemus and the 2 thieves on the cross that are the highlight of this church. A small trivia pointer to look out for: one of the thieves is poking his tongue out! Next I visited the church in Boi which has replicas of beautiful colourful paintings on the north facade (exterior) and all over the church (inside). This is where you can best understand the function of the paintings and the original overall appearance of the Vall de Boi churches. Next I visited the Santa Maria Church in Taull which is free to visit and you can switch on the lights inside to illuminate the interior paintings and colourful altarpiece. The reproduction on the central apse depicts a scene from the Epiphany and it is perhaps the second best painting after the one in the church of St Climent. Both were removed using a technique called "strappo" and can now be seen in the MNAC museum in Barcelona. However, the replicas inside the actual church are worthwhile viewing as they are well made and mostly because its easier to appreciate the overall beauty and architecture of these churches. This church is located in the middle of the village of Taull and its the only one in the valley that seems to have resulted in houses being built around it. I planned to visit the St Climent church in Taull as the last church on purpose as it is rightly known as the most beautiful church of all the churches in the Vall de Boi. Well, it didn't disappoint! The exterior is very well kept and the bell tower is worth climbing to enjoy a spectacular view of Taull and the mountain peaks. However the highlight of this church is undoubtedly its interior with an original mural painting of Cain killing Abel and a mindboggling central apse. The video mapping shows a constant image of Christ in the central apse and every 30 minutes (from 10.30 to 13:30 and from 16:00 to 18:30) a video mapping film is projected on the central apse depicting the exact replica of the famous church paintings. It really renders the sheer beauty of the paintings and it helps you appreciate what would have happened to the original paintings had they not been removed and kept in a protected environment for everyone to enjoy. Overall I spent 2 days exploring the Vall de Boi by car and on foot and I really think that this is one of Spain's Top WHS. This was my favourite WHS on the Iberian Peninsular. The churches and their locations were spectacular, and the interior frescoes stunningly beautiful. I started out from Poble de Segur and took the bus to Barruera via Pont de Suert. This bus arrived in time to catch the Traginer, a local minibus that visits the villages of Taull, Boi and Val de Erill. In the course of a day I visited the four churches in those villages, thanks to the driver of the Traginer who allowed me to get on and off at will. Finally I visited the church of St Feliu in Barruera before catching the bus back to Poble de Segur. The Val de Boi gave me such a happy week in 2004. Taüll was the perfect place to stay, with two of the most sublime Romanesque churches, maintained in truly wonderful condition, just a few metres from my locanda. It was very peaceful throughout, with a natural alternation between visiting churches (mostly each late afternoon) and walking and scrambling through glorious scenery in the local National Park. Catalunya has maintained at least 8 of these astonishing buildings (almost all built around 1185-1215) really well; and they are often in truly striking, beautiful locations. See for yourself one of the Wonders of the Pyrenees ! The romanasque churches are really beautiful, and deserve a visit since they are located inside a quiet and pure geographic region near Pyrenees. Some frescoes were removed in order to be preserved and can be seen in the MNAC museum in Barcelona. The northern regions of Aragón and Catalunya provinces are one of my favourite places in Europe, full of well-preserved small and old villages, some keeping old castles. Built in the 12th century: "The Vall de Boi..bears unique witness to an indigenous cultural tradition which has survived since the 11th century.. The churches...were consecrated during the 11th and 12th centuries. The exceptional number of Romanesque churches.....is attributed to the fact that large quantities of silver came into the region, especially in the first decades of the 12th century. The group of...churches constitute a unique example of the cultural tradition which flourished in 12th century Catalonia (AB) - it could be 11C but the majority of the churches seem to be 12C and that was the period of "flourishing" rather than "commencing"
91 Community Members have visited.